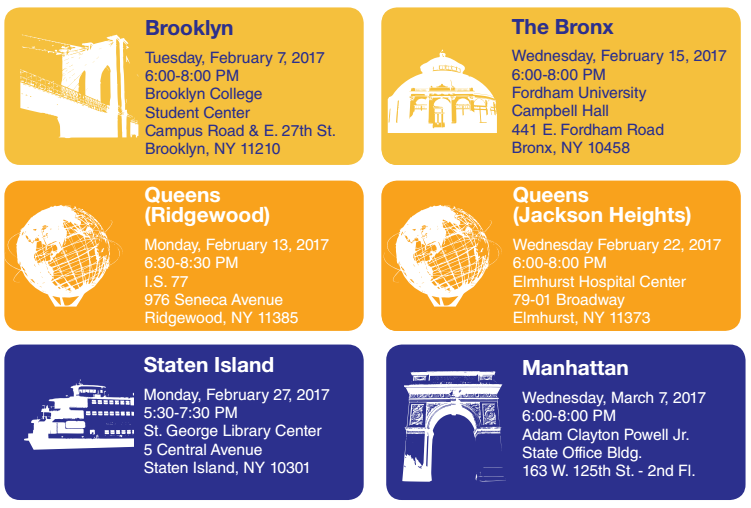 NYC DOT will be releasing a citywide transit plan in the fall, and between now and then, the agency is hosting a series of workshops to hear how New Yorkers want to improve transit service. New York City currently has the slowest bus service in the U.S., and ridership has declined 16 percent since 2002. With the citywide transit plan, DOT is looking to speed up existing bus routes, improve walking and biking access to transit, and plan transit service to meet future demand. Last night, a few dozen Brooklynites turned out to the Brooklyn College Student Center for the first workshop. (There’s also an online survey for people who can’t make it to the workshops.) After a round of events in the winter, DOT will draw up a draft plan to show at another round of workshops in the summer, before releasing a final document in the fall. The idea for a citywide transit initiative arose from 2015 legislation by Council Member Brad Lander that required the city to create a 10-year plan for expanding bus rapid transit routes. While the city’s buses and subways are run by the MTA, DOT can make a big difference for surface transit through its management of streets, sidewalks, and traffic signals. The two agencies jointly plan and implement the Select Bus Service program, New York’s scaled-back version of bus rapid transit. Last year, using BusTime data from the MTA, DOT released a map showing pinch points where bus speeds are the slowest — and where the city should prioritize interventions to speed them up. Ana Fischer, an East New York resident and the community relations director for Council Member Inez Barron, said her office gets frequent complaints about the limited bus access to the Gateway Mall and other parts of the neighborhood. After midnight, Fischer said, there’s no way for Starrett City residents to get home via transit. “You’re not going to be able to get a bus to take you home, so you’re going to have to walk — there’s no other option — or take a cab,” she said. New York City bus service is the slowest in the nation and riders are abandoning the bus in droves, even as the city's population steadily increases. To win people back over to the bus, the advocates at the Bus Turnaround Coalition have pinpointed 10 routes where DOT can make service faster and more reliable.